Attend a Balance free financial webinar to enter. 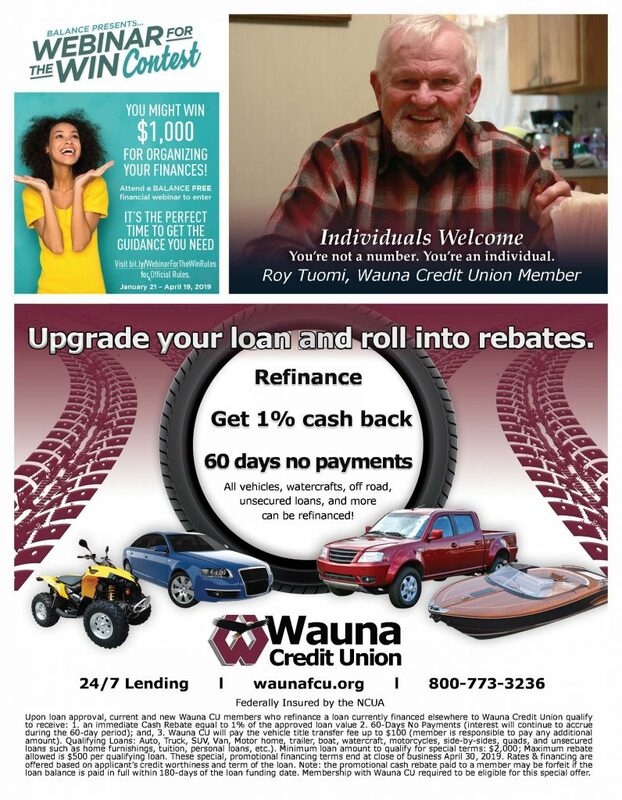 Upon loan approval, current and new Wauna CU members who refinance a loan currently financed elsewhere to Wauna Credit Union qualify to receive: 1. an immediate Cash Rebate equal to 1% of the approved loan value 2. 60-Days No Payments (interest will continue to accrue during the 60-day period); and, 3. Wauna CU will pay the vehicle title transfer fee up to $100 (member is responsible to pay any additional amount). Qualifying Loans: Auto, Truck, SUV, Van, Motor home, trailer, boat, watercraft, motorcycles, side-by-sides, quads, and unsecured loans such as home furnishings, tuition, personal loans, etc.). Minimum loan amount to qualify for special terms: $2,000; Maximum rebate allowed is $500 per qualifying loan. These special, promotional financing terms end at close of business April 30, 2019. Rates & financing are offered based on applicant’s credit worthiness and term of the loan. Note: the promotional cash rebate paid to a member may be forfeit if the loan balance is paid in full within 180-days of the loan funding date. Membership with Wauna CU required to be eligible for this special offer. Weighed Down by Your Credit Cards? Transfer your balances and save! *The special 9-month and 13-month Certificate Accounts minimum deposit requirement is $10,000 New Money only to open the account; New Money may not originate from another Wauna Credit Union deposit account. Deposits exceeding the $10,000 New Money minimum deposit are not restricted. The special 9-month Certificate Account APY is 2.019% and the Dividend Rate is 2.00%. The special 13-month Certificate Account APY is 2.29% and the Dividend Rate is 2.267%. Some fees could reduce earnings. The special 9-Month and 13-Month Certificate Accounts are also available as an IRA. Early withdrawal penalty: We may impose a penalty if you withdraw any of the principle before the maturity date, or the renewal date if it is a renewal account. This special offer is available through January 31, 2019, and may be terminated without notification. Membership with Wauna Credit Union required to be eligible for this special offer. 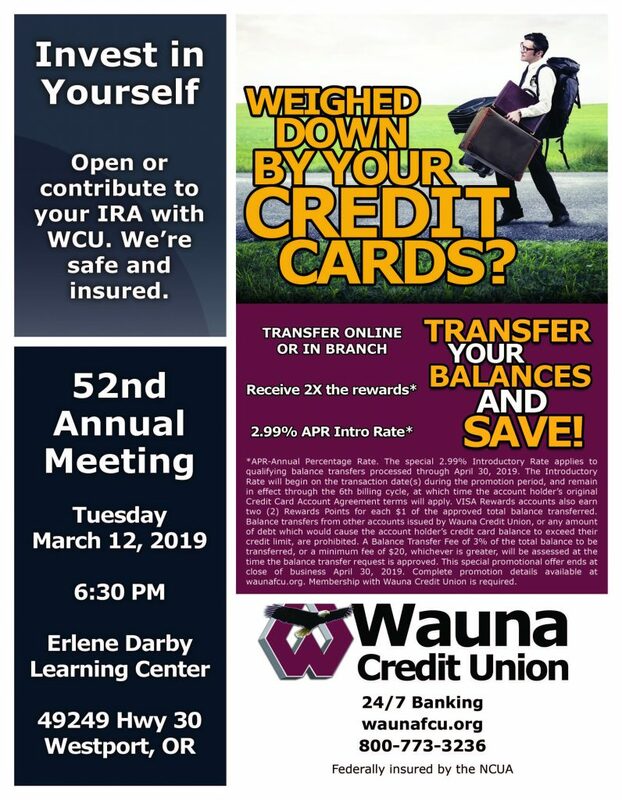 Please contact Wauna Credit Union for membership eligibility details.